To enable an efficient control of persons arriving onboard in port, it is very good to have the accommodation ladder, which leads directly to a reception point near the Deck Office.Personnel should only use the designated means of access between ship and shore. When a ship is berthed or at anchor, the means of access should be so placed as to be convenient for supervision and if possible away from the manifold area. Where practicable two means of access should be provided. Gangways or other means of access should be properly secured and provided with an effective safety net. In addition, suitable life-saving equipment should be available near the access point to shore. During darkness the means of access and all working areas should be adequately illuminated. (5)	Lighters and matches are prohibited to be carried on board. (6)	Riveted shoes shall not be allowed. The deck watch should ensure that access to the ship is denied to all unauthorized persons. Visitors shall be given attention to fire, and shall not be allowed to smoke in areas other than the designated smoking places. Gangways and accommodation ladders may be hazardous if badly rigged, improperly tended or inadequately maintained. Accommodation ladder – A portable ladder hinged to a platform attached to the side of a ship and which can be positioned to provide access between ship and shore. Telescopic accommodation ladder is used for covering a long distance between the vessel and port quay. According to amendments to SOLAS Convention ships constructed on or after 1 January 2010 shall be provided with means of embarkation on and disembarkation from ships for use in port, such as gangway and accommodation ladders. Anyone unfamiliar with such tasks should be closely supervised by a responsible person until considered competent. If inexperienced crewmembers are required to assist with the rigging of a gangway or accommodation ladder, a risk assessment or job safety assessment should also be carried out beforehand in case additional measures to reduce the risk are necessary before commencing the operation. Suitable protective equipment should be worn as appropriate including personal floatation devices fitted with self activating lights, whistles and reflective material, and safety harnesses of the arrestor type rather than fall restraints. Fall arrestors should always be attached to suitable securing points fixed to the ship’s structure. 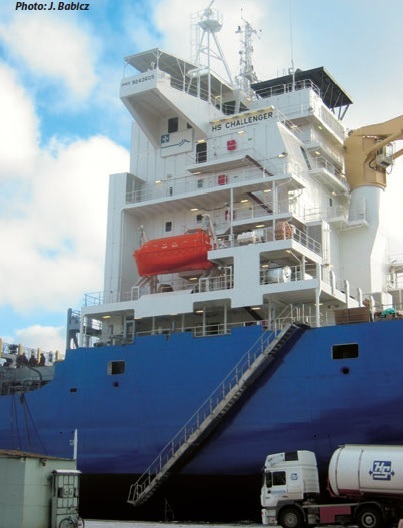 Surveyors carrying out condition surveys for the P & I Club often report occasions where a vessel’s gangway or accommodation ladder was rigged incorrectly. Safety nets are often the subject of such observations and are frequently found to be secured to each side of the ladder along its entire length. This results in the net hanging uselessly below the steps instead of leading away to the side of the ship to catch anyone unfortunate enough to fall off. Consideration should also be given to the angle of inclination, making sure that design limits are not exceeded. It may be necessary to provide alternative arrangements if the means of access is likely to become excessively steep. National legislation on this issue may vary, but in the absence of firm rules it may be prudent to observe UK regulations; a gangway should not be used if its angle of inclination is more than 30° above or below the horizontal, similarly for an accommodation ladder if the angle is more than 55° below the horizontal, unless designed and constructed for use at angles greater than these. Winch bed plates and supporting structures for sheaves and turntables should be inspected for cracks, distortion, damage and corrosion, and repaired as necessary. Control levers/buttons and limit switches should be tested to ensure they are working correctly. Aluminium alloys are highly susceptible to galvanic corrosion in a marine atmosphere if they are used in association with dissimilar metals. Great care should be exercised when connecting mild steel fittings, whether or not they are galvanised, to accommodation ladders and gangways constructed of aluminium. Plugs and joints of neoprene, or other suitable material, should be used between mild steel fittings, washers, etc and aluminium. The plugs or joints should be significantly larger than the fittings or washers. Repairs using mild steel doublers or bolts made of mild steel or brass or other unsuitable material should be considered as temporary. Permanent repairs, or the replacement of the means of access, should be undertaken at the earliest opportunity. The manufacturer’s instructions should give guidance on examination and testing of the equipment. However, close examination of certain parts of accommodation ladders and gangways is difficult due to their fittings and attachments. It is essential, therefore, that the fittings are removed periodically for a thorough examination of the parts most likely to be affected by corrosion. Accommodation ladders and gangways should be turned over to allow for a thorough examination of the underside. Particular attention should be paid to the immediate perimeter of the fittings; this area should be tested for corrosion with a wire probe or scribe. Where the corrosion appears to have reduced the thickness of the parent metal to 3 mm, back plates should be fitted inside the stringers of the accommodation ladder or gangways. Copyright © 2011 Liquefied Gas Carrie.com All rights reserved.